This is one of the most commonly used features of the program. The basic steps are simple and you are guided through them by the program's assistant-style user interface. Select a scheme to resolve file name conflicts (e.g. when two files in the same folder would have the same name, they need to be differentiated appending a number or letter to the end of their name). Select the naming scheme for the batch folders (e.g. "0-99", "100-199", etc. Sometimes, rather than needing to create a new file organization, you need to "un-wind" an existing one. 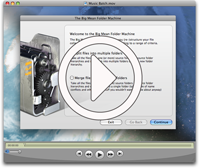 In this case, your files are spread over several source folders and/or subfolders and you wish to place them all into one "big" folder. The main challenge in doing this, aside from the tedious manual dragging and dropping of files, arises from the possibility of "file name conflicts", i.e. several files may share the same name and the Finder will refuse to let you move the files until you given them a unique name. The Big Mean Folder Machine will take care of the rest. Confused by the word "folder hierarchy"? A folder hierarchy is simply a series of folders placed one inside the other. Say you are organizing your photos by the year they were shot and the name of the event that you took them at. You might have a folder for "2007" and inside this folder, you might have a folder called "John's Wedding". Together "2007" and "John's Wedding" are a two-level folder hierarchy.